Why launch on this date? While slavery ended for African Americans in most southern states when President Abraham Lincoln’s Emancipation Proclamation became official on January 1, 1863, Texas slaveowners withheld this news from their slaves. The Emancipation Proclamation had little impact on the Texans due to the minimal number of Union troops to enforce the new Executive Order. However, with the surrender of General Lee in April of 1865, and the arrival of General Granger’s regiment, the forces were finally strong enough to influence and overcome the resistance. Often told is the story of a messenger who was murdered on his way to Texas with the news of freedom. Another is that the news was deliberately withheld by the enslavers to maintain the labor force on the plantations. Still another, is that federal troops actually waited for the slave owners to reap the benefits of one last cotton harvest before going to Texas to enforce the Emancipation Proclamation. All of which, or neither of these version could be true. Certainly, for some, President Lincoln’s authority over the rebellious states was in question For whatever the reasons, conditions in Texas remained status quo well beyond what was statutory. I chose June 19, aka Juneteenth, as the launch date for Black and Blewish to honor the vital role that communications plays in keeping a people either bound or free; ignorant or informed; and enslaved or emancipated. 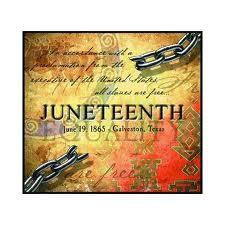 Today, Juneteenth is celebrated not only in Texas, but throughout the country. This blog is all about honoring the need to share information in the interest of surviving and thriving. 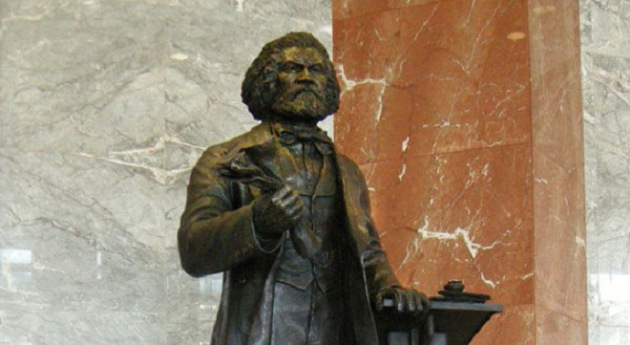 On the Biracial tip, I’m loving that this year, Juneteenth was commeorated in the nation’s capitol by the unveiling of a 7-foot bronze statue of abolitionist and emancipation warrior Frederick Douglass. Wouldn’t you love to hear their conversations when nobody’s around? Here’s a toast and salute to the power and necessity of Emancipation Communications, as essential today as it was back in the day. Information truly IS power, and now that the digital drum is in our hands, let’s honor the tradition of joyously spreading the word. Thanks, Nancy…dangers of late-night posting with exhausted fingers. Appreciate the catch!